On October 15, 2018, at SSB Glenn Maloney Room – G1.310. 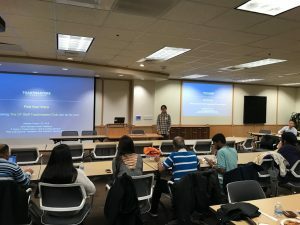 We were pleased to have Melissa Ossian and Thuy Nguyen from UT Staff Toastmaster Club, and for giving an overview of the club and some exercise tips on public speaking. A variety of Korean food from Mom’s Taste was served.